Wearing too much protection gear in many action sports has always been the sign of rookies, greenhorns or nitwits. Starting with simple bike riding, through skateboarding and skiing to sailing, those who wore helmets, kneepads, gloves and other means of protective gear were considered posers and not true sportsmen. I was also thinking that way in my teenage years, marked with scars, wounds and bruises gained throughout doing such sports. When I started sailing my opinion did not change much until I got seriously burned by the rope running through my hands. That was the moment when I realized why gloves really are for beginners and/or nitwits, but also why experienced ones do not have wounded palms… Ever since that first sailing injury sailing gloves are close to the top of my sailing gear in my skipper’s bag. First of all, it happens more often that beginners get confused with all those ropes on the deck and sometimes it happens that some rope accidently starts running without control. If the rope is in someone’s hand, instinctively they would clench their fists and try to stop the running rope. Poor palms would get really burned and heavily injured if there are no gloves to protect them. Even experienced sailors can not escape their instinct and let the running rope go instead of clenching it. On the other hand, in conditions of cold weather sailing gloves not only protect our hands from cold but keep them safe because with bare hands splashed by cold water and dried by the cold wind you can’t do anything but put them in your pockets. So, when I started to wear gloves I started noticing that not only do I feel more comfortable and safe, but I also became a more useful member of the crew. Throughout the years of experience I did not notice serious difference between gloves made by different manufacturers. 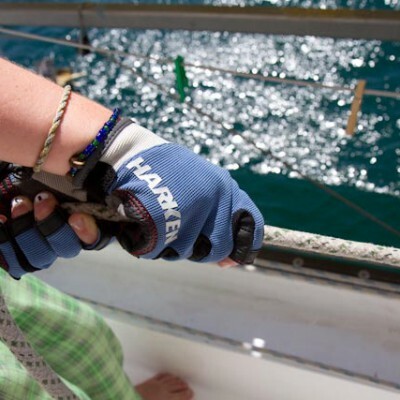 Musto, Gill, Marine Pool, Slam, Harken… they all make fine gloves in different shapes. When purchasing sailing gloves the major point of choosing them is to pick the ones which are perfectly tight to your palm and fingers. If they are too tight your blood circulation will be blocked and your hands won’t be of any use. If they are too lose, the wrinkles will appear when using them and you will most certainly get blisters. You probably noticed that there are different shapes of sailing gloves – long fingers, half-fingers, 3-finger etc… that choice is also personal. I prefer those gloves which have at least a thumb and a forefinger free, which allow me to be more efficient when using sailing foldable knife and/or when it comes to repairing some defect on the deck in the middle of the race. I wish you a calm sea, a fine wind and a strong mast! Janko is a professional skipper in love with writing. Our most prolific blogger, he has sailed the Adriatic from the north to the south. With an incredibly broad array of interests, Janko is an expert in a variety of topics, all of which he delivers to our readers in a clear, imaginative and often humorous manner. NM chick 52 on What’s your favorite sailing song?